Thanks all for entering the contest! I really enjoyed reading the descriptions of your practice. The two winners of MyVirtualYoga.com 3-month membership are speakingofvegan and vera. Please email me your email address so I can pass it on and get you started on your home yoga practice! In other news, I think I’m in need of new socks. What do you think? Being broke all the time, I try and get the maximum use out of all my purchases. 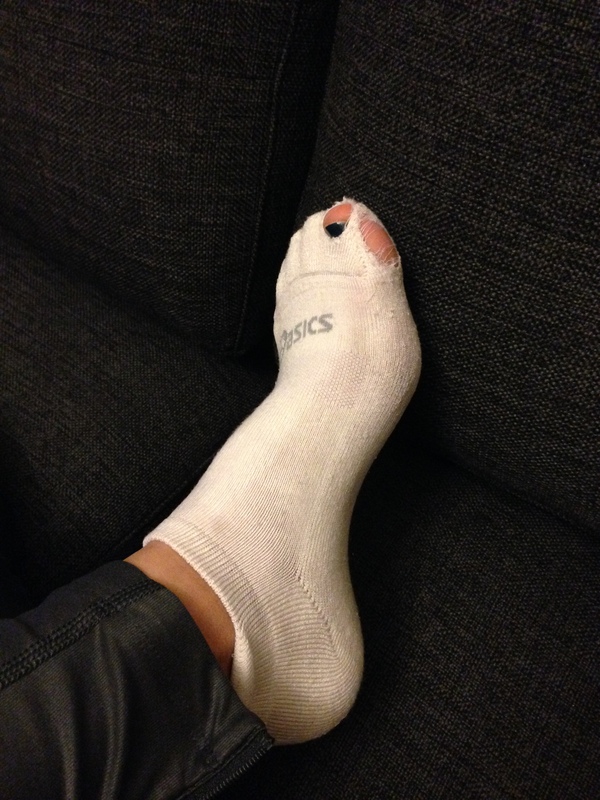 I noticed a hole in this pair about a few months ago and I was strategic about which foot I put this sock on. I mainly kept it on my right since there was less rubbing with the small hole by my fourth toe. However, I guess I wasn’t paying attention prior to my run (might have something to do with the fact that I was about to experience a 3-day stomach flu!) and my inattention means this pair is now officially retired. Any favorite running sock suggestions for me? ?